George H. Fort, 73, of N Chestnut Street, Port Washington died Monday, April 12, 2004 at Columbia St. Mary’s Hospital – Columbia Campus in Milwaukee, Wisconsin. He had been battling cancer for the last couple years. He was born August 3, 1930 in Marinette, Wisconsin to George H. Fort, Sr. and Anna Butler. 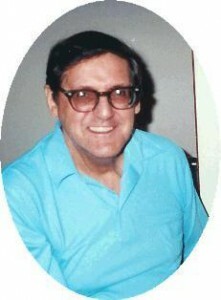 In 1963 he moved to Port Washington and worked with the EST Manufacturing Company in Grafton. He met and married Shirley Runkel of Port Washington on May 22, 1965 at St. Mary’s Church in Port Washington. In the mid 1970’s he was hired at Rostad Aluminum in Grafton and held numerous job positions until he retired as a finisher in 1996. George enjoyed his retirement. He cooked most daily meals and made a great pumpkin bread. He was most comfortable in his yard and would tend his garden or grill. He enjoyed just putting around. He is survived his wife Shirley and three children Denise Heimerl of Port Washington, Mike (Janet) Runkel of the town of Port Washington and Casey (John) Turenne of Port Washington. He was a proud grandfather of 7 grandchildren and 3 great grandchildren. Further survived by nieces, nephews, other relatives and friends. Seven sisters and a brother precede in death. Memorial services will be held at 5 pm on Friday, April 16, 2004 at the funeral home. Pastor Mark Voll of Friedens Evangelical Church will officiate. Visitation after 4 pm Friday. George will be cremated with final entombment at St. Mary’s Cemetery in Port Washington. Memorials to the Vince Lombardi Cancer Clinic (c/o Aurora Health Foundation 2629 N. 7th Street – Sheboygan, WI 53083) appreciated.